There are many bookshops in Oxford, but the biggest and nicest are Waterstones on the corner of Cornmarket and Blackwell’s in Broad Street. Both have good children’s sections, although recently it has been Blackwell’s that I’ve been finding much more interesting: they offer numerous new, beautifully-illustrated hardbacks, while the selection of just-published picture-books at local Waterstones is upsettingly small. If you are wondering why, at the age of twenty-nine, I am so invested into picture-books, an answer is below. The Liszts is a joint product of Kyo Maclear, a Canadian author, and Júlia Sardà, a Spanish illustrator. The cover got my attention at once because it is visually stunning — as is the rest of the book — and reminiscent of works by Gustav Klimt, such as Nuda Veritas (1895), Judith and the Head of Holofernes (1901), and The Kiss (1907–8). The lettering and the borders which look dark-yellow in the picture above are actually golden. If you feel there is something morbid about the Liszts, you are not wrong. As characters they seem to be related to the Addams Family, with the house mirroring the Addams Mansion and Winifred sharing Wednesday’s taste in swimming suits. There is a black cat, that typical witch’s companion, a Visitor whose face is obscured by his hair (cf. Cousin Itt), weapons and trophies on the walls, and the general state of picturesque neglect and decay — as exemplified by the dry swimming-pool and the overgrown garden. Another parallel that comes to mind is The Royal Tenenbaums (2001), the comedy-drama directed and written by Wes Anderson. The three Liszt children are clearly very intelligent, not unlike their Tenenbaum counterparts, and there seems to be a similar sense of disconnect between the generations: we do not see the book characters participate in any parent-child activities. Each Liszt is preoccupied and isolated with, eventually, the middle son taking care of the unusual situation that propels the plot forward. I have just written 500 words analysing a picture-book that is, supposedly, aimed at five-year-olds. That said, I see absolutely no contradiction: The Liszts is a great example of family entertainment that can be enjoyed by adults and kids. That approach is now almost customary for animation (think any recent feature by Pixar, Disney, or Dreamworks), and it certainly works for books as well. Kyo Maclear has previously published two novels, The Letter Opener (2007) and Stray Love (2012), the former shortlisted for the 2007 Amazon/Books in Canada First Novel Award. In addition to The Liszts, she is an author of four other illustrated books for children, having collaborated with a number of artists. Personally, I am quite curious about Virginia Wolf (2012), loosely based on the relationship between Virginia Woolf and her sister, painter Vanessa Bell. The pictures by Isabelle Arsenault look fantastic. The plot idea certainly suggests that grown-ups will find a special joy in the book, recognising the references and the twists (see the text on The Liszts and associations above). A picture-book is necessarily a collaboration, and The Liszts is a wonderful example of an artist and a writer working together. The story as text and as a visual narrative are one and the same, which is quite a feat to accomplish. Lists in word form and lists in the background of images, handlettering, the page arrangement — all of it combined does service to the medium. 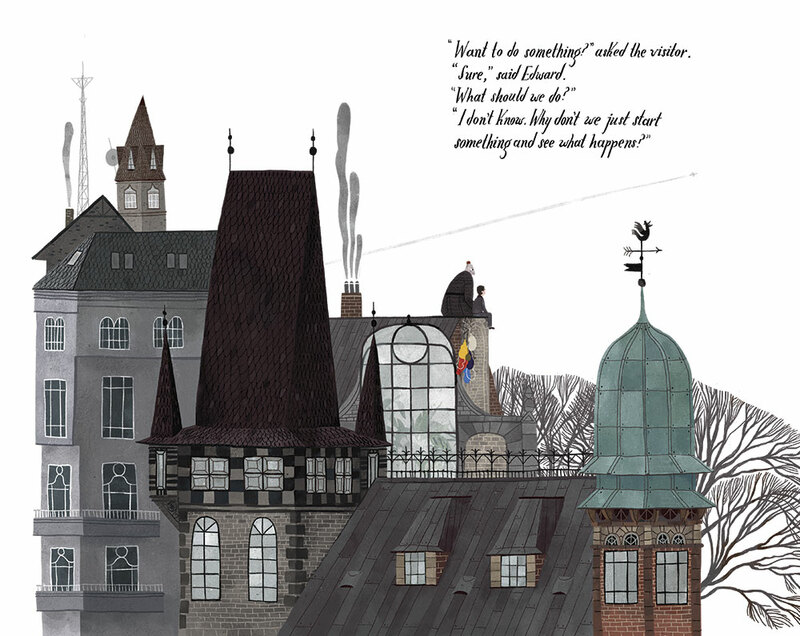 And, while each illustration is a work of art, it is the text and its rhythm that make the story complete. Júlia Sardà, the illustrator, is my personal discovery. I’m sold, I’m lost, I’m in love. I want to buy every book that has her pictures in it, and then find where she lives and haunt her waste bins so that I can frame their contents. That sounds slightly overzealous, but if you head over to her website and have a look at the examples of her work, you will understand my feelings. And if you are left craving more, she also has a blog. The Liszts is a beautiful and fascinating book that offers a lot of food for thought and to the eye (the almost-distracting attention to detail is another trait that Sardà shares with Wes Anderson). If there is a lesson or a morale in The Liszts, it is not an overt one, but a suggestion that you should leave your mind open to new possibilities, ask the questions that pile up on the inside, and take care of your surroundings. If I were to describe this book the way clueless customers do at bookshops, I would say that it was golden and made me happy. Do you have it?